Pinterest users were startled to find that the site sometimes gets a sales cut when visitors buy products featured in user-submitted "pins." NEW YORK (CNNMoney) -- The social networking field's buzziest startup is under fire this week for not being completely transparent with its users. Pinterest, which allows users to create a virtual pinboard showcasing items they find around the Web, has quietly been appending affiliate links to some pins -- the ones featuring goods for sale online through Amazon (AMZN, Fortune 500), eBay (EBAY, Fortune 500), Target and thousands of other merchants. Those links generate payments for Pinterest from the retailers if someone clicks through and buys a product featured in the pin. The practice has been going on for months, but drew little notice until a blog post this week on LLsocial.com highlighted and explained the modified links. "It's big news in the tech community because Pinterest is the social network that everyone wants to take to the prom this year," says Amy Webb, CEO of strategy firm Webmedia Group. "As a result, everyone's paying close attention." Pinterest was founded in early 2010, but its traffic soared over the past six months as its popularity snowballed. CNN.com commentator Pete Cashmore recently called it "the breakout social network of 2012." 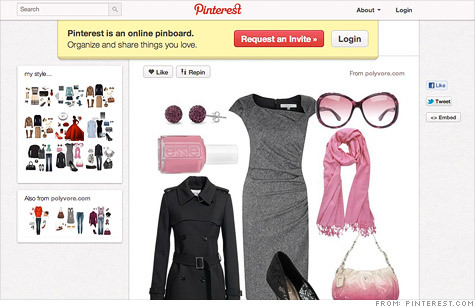 Pinterest's pins let users create online catalogues spotlighting their passions, such as travel, fashion and design. But many users weren't aware that that the company had been monetizing their content. Pinterest works with a marketing company called Skimlinks to add the affiliate links. In a blog post on Wednesday, Skimlinks CEO Alicia Navarro said that Pinterest's use of Skimlinks' service "is nothing new, nor is it secretive." It's not secret, but it's also not clearly disclosed. That's what landed Pinterest in hot water with some of its users. "While as a user I don't mind Pinterest making affiliate money, I do wish they mentioned it in the FAQ's," blogger Lindsey Mark wrote in a comment on LLsocial.com. "I have no issue with the company trying to make money, I have a huge issue with their lack of transparency," another commenter wrote. Pinterest co-founder Ben Silbermann declined to comment on the issue. Some Pinterest users leapt to the company's defense. Monetization -- developing a revenue stream to support the costs of running the service -- is often a major obstacle for Web upstarts. Pinterest doesn't currently have a business model, but investors have sunk an estimated $37 million into the fledgling company. That means it will at some point need to make money. "If someone can come up with a way to give me a great service and not charge me directly, more power to them," commenter "Nick the Geek" wrote on LLsocial.com's post. "Servers aren't free, people writing this code don't do it for free." That's the view Skimlinks took as well. "Online communities need ways to generate revenue to support their operations, and the preference is always to earn this revenue without disrupting their users or detracting [with] flashy advertisements," Navarro wrote in her blog post. Webb said that whether or not Pinterest meant to hide its moneymaking links, users should assume that all free networks come with a price tag. "Were they purposely being murky and not transparent? It's possible," she said. "I would think that they would let people know from the beginning that things they're posting potentially carry affiliate links. But it's a free network. No free network carries zero costs."